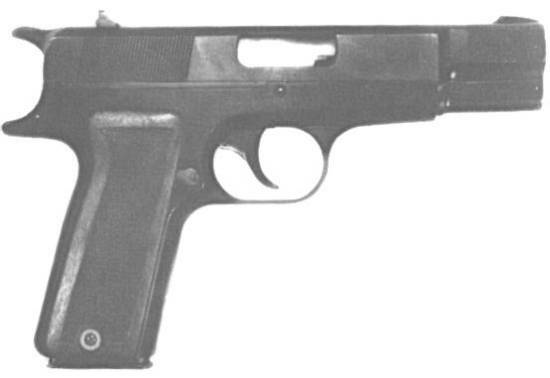 The NAACO (located in Toronto, Canada) began production of a semi-automatic handgun in the 1950's which was patterned on the existing Hi-Power design. Utilizing a new cartridge (not the 45 ACP round) the pistol utilize features from the Soviet Tokarev and the French M1935. The design was never proven as only one pistol was manufactured, however it was ahead of many designs at the time in it's use of an aluminum slide to reduce weight. However the military at the time in Canada did not want to re-tool their production and re-equip their forces with another weapon. As such the weapon never went into production. It is interesting to note that today many have falsely assumed the NAACO Brigadier was just simply a 45 ACP version of the FN Hi-Power.